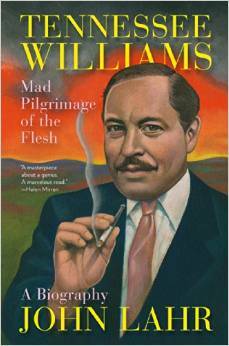 John Lahr brings us the definitive biography of Tennessee Williams; the man many feel is America’s greatest playwright. My review copy came yesterday and I stayed up all night reading and this is not a short book—it comes in at 765 pages. Some of you know that I know Williams—my senior year at college I worked a bit for him when he was in New Orleans so I am always anxious to read a definitive biography of him. However, he was a man who was so complex that I doubt that there will ever be a “definitive biography”. There always seems to a lost page or some interesting information turning up about Williams. However this is the most complete biography I have yet to read about him and I have read them all. Lahr takes us into the mind of the playwright. Williams was responsible for so much but I really believe that his greatest accomplishment was the way his dramas reshaped the theater of this country as well as the way Americans felt about themselves. I have always thought of Williams as something of a contradiction. He had triumphs which were epic and he failures that were also epic, he was a gay man at a time when homosexuality was spoken of in whispers yet he managed to create some of the most wonderful female characters that the theater has ever know. He suffered great guilt and he projected some of his life into his works. He had numerous love affairs but only two real loves. His death reflected the way he lives even though it was misreported and his estate caused problems among his heirs and his non-heirs. This biography is written through Williams’ plays and we see what he went through with each new offering. Lahr gives us an unforgettable look at the man and we learn some interesting secrets. There have been several other biographies of Williams so some of you may wonder why we need another one—the answer is simple. There is a great deal of new material here—new interpretations, new photographs (there are 80 photos in the book, new information and new ways to look at Williams output. We have letters and interviews with Pancho Rodriguez, the man who was the model for Stanley Kowalski. There are letters from Frank Merlo, the man who shared Williams’ heart and his bed. Eddie Dowling who was in the original production (as well as produced and co-directed) of “The Glass Menagerie talks about the opening night night. We learn about Laurette Taylor and her legendary performance as Amanda Wingfield. We get to read the letters that Williams wrote while he was committed to a psychiatric ward in 1970. The facts of his death and of the craziness that went on with his estate is here as is the true story of Williams’ break-up with his long time agent, Audrey Wood. There is information on how legendary director Elia Kazan influenced the productions that he helmed. Marlon Brando has something to saw about co-star Anna Magnani. Included are previously unpublished poems and deleted passages from some of the playwright’s writing. Included are never before seen letters between Williams and Kazan, Wood, Magnani, Katherine Hepburn and Brooks Atkinson, drama critic of “The New York Times”. We learn about the autopsy performed on Williams and the medical reports of his sister, Rose, who suffered a lobotomy. There is also new information about Williams’ psychoanalysis and original interviews that John Lahr conducted with Gore Vidal, Dotson Rader, Dakin Williams (the playwrights’ brother) and with several directors including Sidney Lumet and John Hancock. Here is Williams’ public persona and his backstage life. It reads like one of Williams’ own dramas but above else this is a compelling biography of a compelling man that is written by a compelling author. This entry was posted in GLBT memoir and/or biography, GLBT non-fiction on August 30, 2014 by Amos. Thanks for such a clear review of this giant book. I am convinced after reading your review that it is a must-read for me. I was hooked when you said it was a biography from the point of view of his plays. I found Paul Mariani’s Biography of GERARD MANLEY HOPKINS from the POV of his poems and their genesis that this is my preferred format for a biography of a writer. I know Williams like most Louisiana boys do, but I want to see this whole view. I have the partial view. Williams was so scary because he lived a life that had any of us tried we might have, sans the plays, and the tragedy and suffering of being gay when he was is heart wrenching, but we all lived in this shadow. We southern queers know what a bloody road it was to be out, to be in the public eye. It is the great love of theater that draws me to this book. I thank you for your penetrating review. Once having lived in New Orleans French Quarter, we seem bitten by some mosquito that makes us sisters to Williams! lol, and one cannot learn enough about him. It is a lifelong quest to seek the truth about Williams. I don’t think I ever put two comments by a review Amos has posted, but my copy came a little over 24 hours ago. I’ve slept little, and was fascinated by the book. It’s beautifully written and so many photos it is almost like an illustrated story. The insight into “Tenny’s” mind (Tenny is the name my friend Babs Zimmerman gave Williams when they were friends) …the insight into Tenny’s mind via the plays and ccorrespondence are entrancing. 100% for this book, five stars, A+. Talk about a massive volume! It’s big! It’s great!